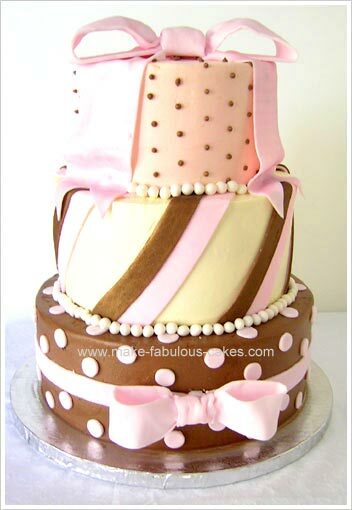 This modern pink and brown bridal shower cake is a great centerpiece for any bridal shower. This cake was actually inspired by a beautiful creation made by Carrie's Cakes. Although this cake was made for a bridal shower, this can easily be adapted for a wedding cake or a girl's birthday cake. 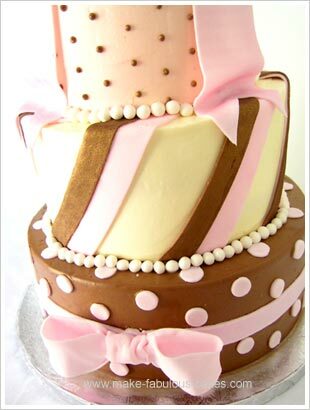 This cake was iced in buttercream, decorated with pink and brown fondant and bordered with fondant pearls. The fondant pearls were made ahead of time. I made these about a week before the cake was due. These are actually easy to make, it just takes a bit of time. To make the fondant pearls, roll out a white piece of fondant to about 1/8" thick. Take a large round pastry tip (I used an Ateco tip# 809) and start punching out holes on the fondant. 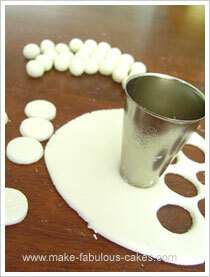 Take the circles of fondant and shape them into pearls using the palms of the hands. Let dry on a soft surface such as foam to avoid having a flat side on the pearls. Once a bit dry place the fondant pearls in a zipper bag with pearl lustr dust. Give a shake until pearls are covered with dust. Also made ahead were two pink colored bows. Read this tutorial on how to make a fondant bow. I made one large bow, about 6" long and 3" wide. I also made a smaller bow with the dimensions of 4" x 2". For this bridal shower cake, I used 6", 8" and 10" round cakes. There were 2 layers for each size and each was torted and filled with buttercream and strawberries. The bottom 10" layer was iced with chocolate buttercream. The middle 8" was covered in vanilla buttercream and the top layer was iced in pink colored buttercream. The cake was stacked with dowels as supports with a central dowel thru all the cakes. To decorate the bottom layer, I rolled out a very long strip of pink fondant. I measured the side of the 10" pan that was used to get the circumference of the cake. Using a ruler and pizza wheel cutter, I cut strip of fondant about 1" wide and the length was the circumference of the cake pan which was 32". I carefully rolled this strip, placed it against the mid-section side of the cake and unrolled the strip while turning the cake until it got back to where it started. Take the small pink bow and place over the seam to hide it. I used a ruler to straighten the strip. Cut out small round pink fondant and place all over the cake. For the middle tier, strips of pink and brown fondant were cut and placed on the diagonal on the cake. The excess pieces on the bottom and top were cut with a knife. And finally for the top cake, small dots of chocolate buttercream were piped all over the cake. A thin strip of pink fondant was rolled thin and cut into to strips of 3" x 9" with one end of the strips cut in a fish tail. To add on top of the cake, start at the top of the middle tier and bring the strip to the top and finish at the center of the cake. Repeat for the other strip. You may have to cut off excess fondant. Place larger bow on top. Finish the cake by placing fondant pearls. 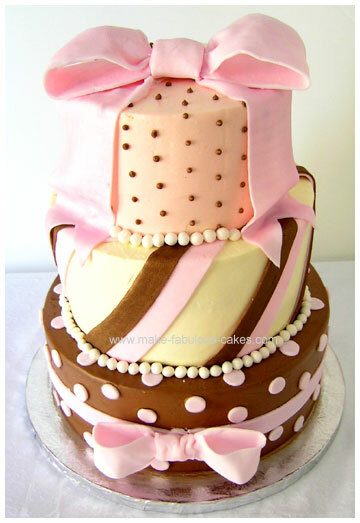 And there you go, a modern pink and brown bridal shower cake.